1. If you had to describe (durian), what would it be? 2. Have you guys eaten any other exotic fruit like this (durian)? (Daniel) Not that I remember, I thought that I tried pretty much all fruit but the most exotic I’ve had was probably a coconut! I liked coconut; I’ve never tried anything like this (durian), just the texture… I had no idea. It’s really ‘interesting’. 3. 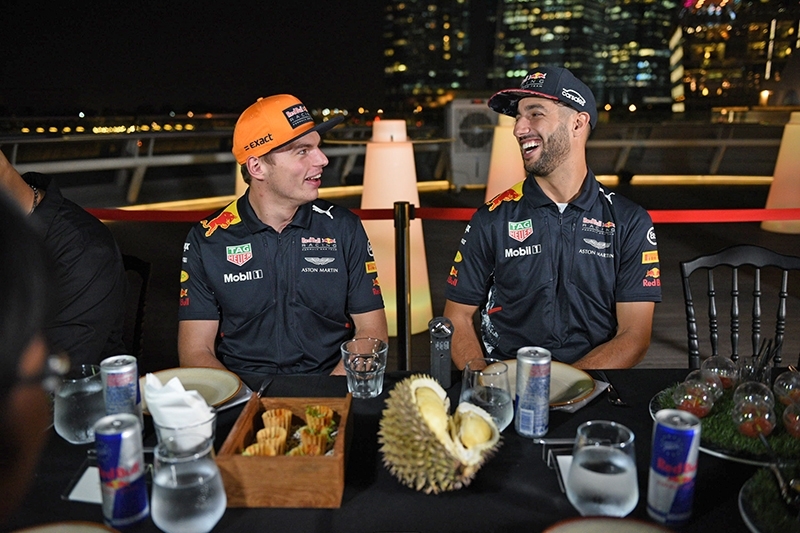 Max, if you had to choose between a shoey and a durian, which would you choose? (Max) Oh, a shoey a hundred times! I would drink like one hundred! I just really, really don’t like (durian)… really. For me it tastes like puke. 4. 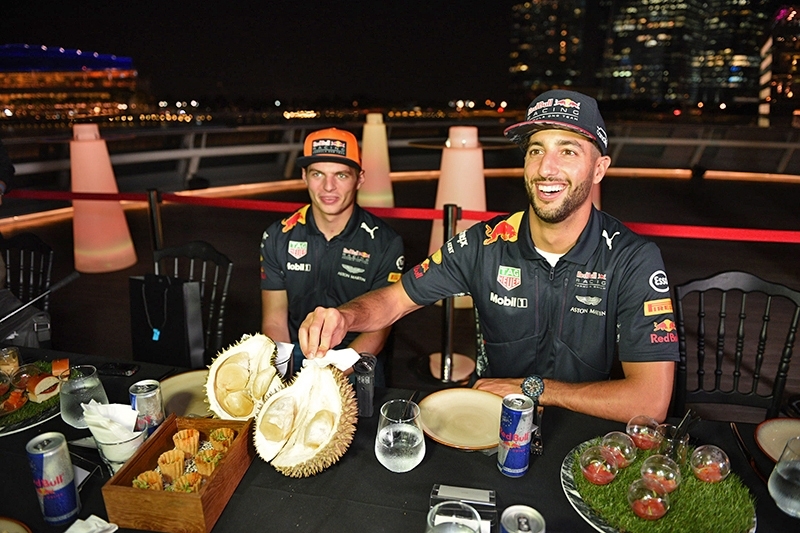 How about you (Daniel), did you like the durian? (Daniel) Absolutely not. The smell – I thought the smell would be worse, but then the taste – I thought maybe it tastes better. The taste was even stronger, and the texture was weird. 5. What would it take for you (Daniel) to have one seed of durian? (Daniel) I would definitely need five thousand dollars cash on the table right now. No, ten thousand… price just went up! 6. The Singapore night race has been touted to be one of the most challenging circuits of the series. Can you guys give me your thoughts about it individually? (Daniel) I think it’s challenging because it’s a street circuit and it’s really hot. The heat affects you physically, which can then affect concentration – as a street circuit, you already need more concentration, so you’re battling against those two (aspects). 7. Do the daytime-style floodlights help you, or are they of no help? (Daniel) I don’t think it changes (the situation) too much – the lighting’s pretty good; you get some darker spots but the darkness won’t ever be the cause of a crash. 8. Considering the entire Singapore circuit, which do you think is the toughest part/corner of the circuit? (Max) That changes a bit with the car balance as well, if you don’t have a particularly great car balance in the faster corners, then it’s difficult to drive the faster corners, if you’ve got a great balance in the slower corners then it’s alright. Every year can be different – like last year, I had difficulty warming up the tyres in the beginning of the lap, so for me the beginning of the lap was very difficult. 9. Which do you miss more about Singapore – the Singapore Sling cocktail, or the now-replaced Singapore Sling chicane? (Daniel) I prefer the cocktail. (Max) I’ve haven’t driven the the old combination. (Daniel) Now it’s probably better as well, the old one was so bad, and your helmet would smash the headrest. 10. You guys have been here before and tried local food, which one would you say is your favourite? (Daniel) Chilli mud crab – I like spicy food, and I like crabs. 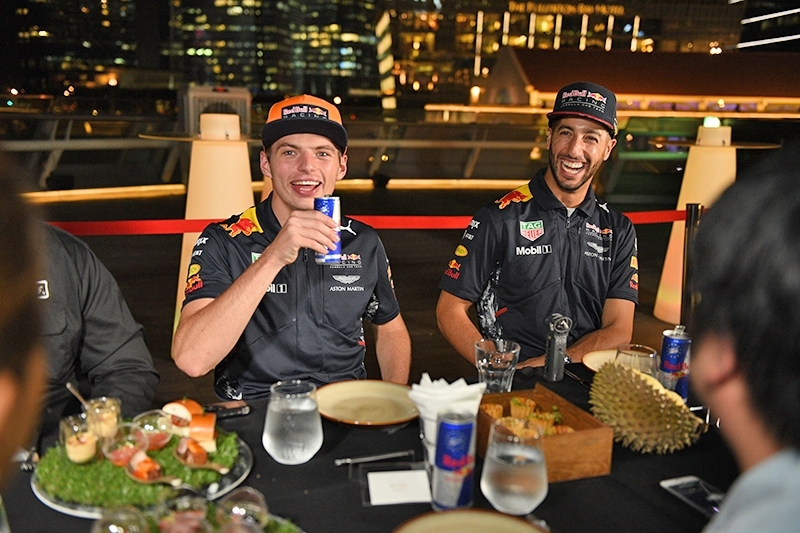 (Max) I haven’t really tasted a lot of ‘real’ Singapore food. I like the chicken – because I don’t like fish – just like the chicken prepared in Singapore, like chicken rice. It’s a bit more spicy than the ones in Europe, but it’s good.